I’ve recently made a couple of changes to my skincare routine, and while I’m loving all of it, I thought I’d take the time today to highlight my new night cream: Balance Me Daily Essentials Moisture-Rich Face Cream (the longest product name in the world, surely?). Yet another of my magazine-front treasures from this summer, I initially didn’t like this cream, as I found it too rich and thick for my skin. Now that the weather’s gone rubbish, and my skin needs a bit of extra coddling, I’ve found that I’m really loving the richness of this cream – a little really goes a long way! I would definitely only recommend this as a night cream, unless you are someone with exceptionally dry skin; I do find that it can leave a bit of a sheen on my face after application, and it’s slightly too slick to apply foundation well over. But as a night cream, it’s great. When I wake up the morning after I’ve applied this, my skin looks calm and smooth, and, well, normal. But normal-on-a-good-day. As with the other Balance Me product I tried recently, the Super Toning Body Wash, this has a 99% natural origin, and none of those nasty things (you know, the ones that you know are bad, but don’t know exactly why) that worry the more conscientious among us. It does contain quite a hefty amount of shea butter, which accounts for the richness of it, but somehow doesn’t influence the smell, which is great for me since I don’t like the smell of shea. This is quite heavily fragranced, with a herb-y rose sort of scent, but it doesn’t linger after you’ve applied it, so it shouldn’t clash with anything else. Priced at £24 for 50ml, this is definitely at the higher end of the market, and for that reason alone I probably won’t repurchase. However, if you’re happy to spend a bit more than me on your skincare, this is a really lovely option! 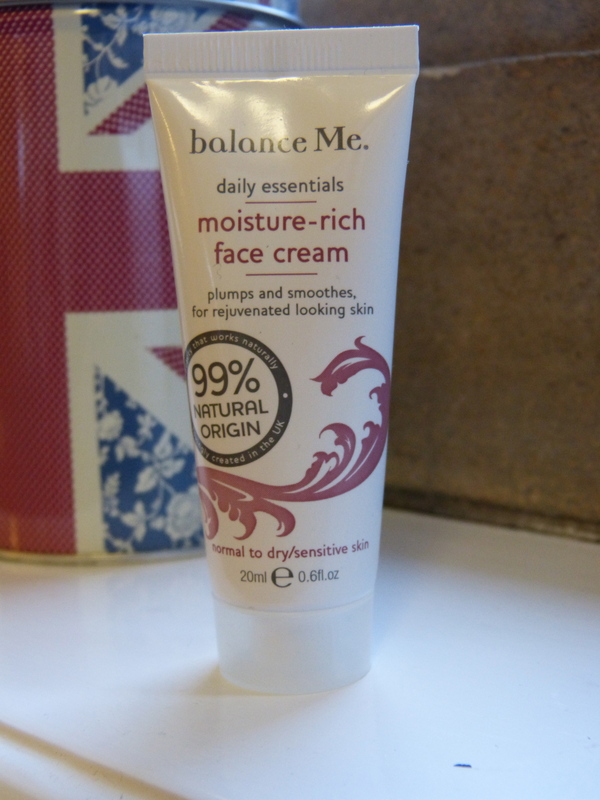 Have you tried the Balance Me Moisture-Rich face cream? What do you think? This entry was posted in Beauty and tagged balance me, balance me daily essentials, balance me daily essentials moisture rich face cream, beauty products, beauty review, face cream, face moisturiser, moisturiser, night cream, skincare, toiletries. Bookmark the permalink.